Slight bit of déjà vu today with updates on two campaigns that I previous blogged about. 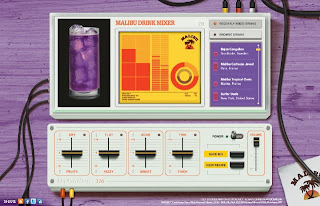 Following this morning's Budweiser Lyrics update of sorts I got an email from Francois in Great Works to let me know that Malibu's Radio Maliboom Boom has just launched the latest digital instalment of their campaign: the Malibu Drink Mixer. The Malibu Drink Mixer is a digital tool that offers the perfect drink recipe by playing around with sonic variables that correspond to a range of different taste preferences. And if that doesn't sound like some serious high tech wizardry then I don't know what does! The whole thing has been designed by a team of renowned DJs, and is said to provide "a deep sensory experience by allowing fans to experiment with mixing sound and taste together". All in all the Malibu Drink Mixer offers 625 beat variations and 81 different drink recipes, with the drink outcome offered to the user along with a corresponding recipe and downloadable MP3 that can be used as a ringtone, shared with friends or posted to their blog.